More world citizens and more Americans go hungry each day than ever before in the history of the world. 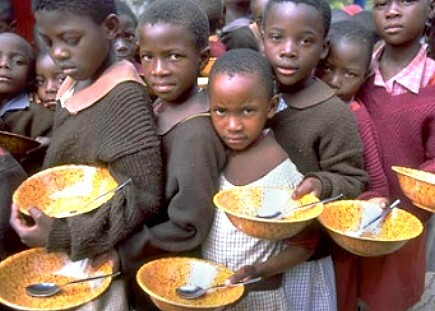 One billion people out of the 6-billion who inhabit the earth, do not have enough to eat. Almost 17% of the world’s population — 1-in-6 people in other words — are undernourished or malnourished. In the United States of America, the numbers are no better: 16%, or 49-million Americans do not have access to adequate food. Again, 1-in-6 in the most affluent country in the world go hungry. The reasons for this record rise in world hunger lie in the global economic crisis coupled with the rising cost of food. Food costs worldwide have increased 24% in just 4-years. Civil unrest has followed the increasing cost of food and threatens to be the next global catastrophe. But, here’s the interesting part: In a newly-released Pew Forum survey, a majority of Americans prefer that religious groups feed the hungry and homeless. Faith-based programs remain popular with the American public, and 52% said faith-based organizations are best able to feed the hungry. Interestingly, those numbers are actually up from 8 years ago when the same questions were asked. But are faith-based groups, churches included, doing what we can to feed people? If 1-in-6 persons are hungry in America and the world, they should no longer be invisible to us. Unfortunately, the hungry are disproportionately poor, minority, and marginalized by society. They remain invisible to a vast majority of Christians because our paths do not cross, our children do not go to the same schools, and our social calendars do not coincide. But this is a golden opportunity for faith-based groups to step up and fulfill the vision that America has for us. If we as churches can do what our culture thinks we ought to do, which includes feeding hungry people, then we might find our place again in our own culture. With church attendance continuing its 50-year decline from a high of 40% to today’s 17.5%, we need to reclaim our place in the world. Wouldn’t it be interesting if the church reclaimed its place in culture by finding its place among the poor? Of course, that’s what Jesus did. And he fed them, too.